Earlier this week I noted that three strong Big 12 teams are facing a crossroad this offseason on defense. First there’s Oklahoma, who just blew a chance at a national title due to undisciplined and frankly soft play on defense this past season. Then there was Oklahoma State, who just hired Jim Knowles to update their approach from a multiple 4-3 to a more execution-based 4-2-5. The story out today is that Bill Snyder intends to address the retirement of Tom Hayes, six-year DC at Kansas State, by promoting Blake Seiler to DC. Seiler is a rising star in Manhattan. After starting as a grad assistant, Seiler coached the DEs for a time, including Ryan Mueller and Jordan Willis. Last year he was moved to LBs to replace another retiree who’s name I can’t remember and don’t want to trouble myself to Google. Everyone was very impressed with the job he did coaching the LBs…obviously Snyder feels he did a great job but personally I wasn’t expecting any trouble for him in communicating technique and assignments to a pair of redshirt senior walk-ons. The year 2011 is when Tom Hayes was hired to Kansas State, initially as the DB coach. In 2012 he was promoted to DC and coordinated what was by far the best defense of the second Snyder era. From there it was a gradual decline with a few solid, top 45 units and then a few hard-working but overmatched squads. So what was different about 2012? Many people would probably answer “Arthur Brown!!! !” but the 5-star Miami transfer played on the 2011 team as well which wasn’t as dominant and it’s not as though K-State hasn’t had good LB play since Brown left. 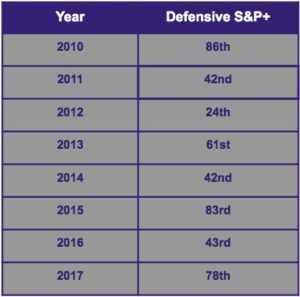 Go watch that 2012 defense and you’ll see that it wasn’t really Brown that made them so much better than other K-State units we’ve seen. What was special about the 2012 group is that they were as disciplined and assignment sound as any other defense we’ve seen from Snyder AND also more talented. There are a number of features to this group that make it unique from other Wildcat defenses of this decade. For starters, it was entirely comprised of guys in their third year or more of playing college ball. For another, it was heavily loaded up with JUCO transfers. Snyder looked to infuse talent quickly from the JUCO ranks in this part of the decade and found his entire DL from those ranks. In fact, this was probably the most athletic defense that K-State has fielded this decade and perhaps by a fairly wide margin. 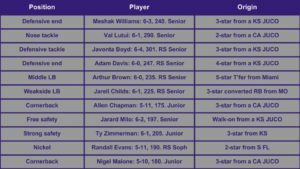 Adam Davis was a stud at DE and Meshak Williams an absolute terror off the edge, Lutui and Boyd were both big and strong inside and very difficult to block, Brown might have been the best LB K-State has had this decade and Evans certainly the best nickel, Zimmerman the best safety? Another crucial detail to this group was that in addition to being more athletic overall than other Snyder defenses this decade they were also every bit as disciplined and cohesive. They played a good deal of cloud quarters coverage and they traded off receivers like pros, never giving a clear window and forcing the QB to hold the ball against a very dynamic pass-rush. A big part of that was probably the fact that Nigel Malone and Allen Chapman had been teammates at City College of San Francisco the year before. This wasn’t a team that was just getting by on athleticism and talent up front, they had a brilliant run through the Big 12. The only two stains of any kind on their resume came in two games. The first was against a surging Baylor team that was starting to light everyone up after inserting Lache Seastrunk at RB, Kansas State had to play a young and unready Dante Barnett at SS in that game due to an injury to Ty Zimmerman and the Bears lit him up. The other stain came against a very difficult spread-option attack from Oregon in the Fiesta Bowl (last game coached by Chip Kelly) and the Wildcats held them to 385 yards. They lost that game and conceded 35 points due to a kick return score and an ability to score on offense. As much as I love K-State’s tradition and ability to plug in lower-ranked players and walk-ons and produce solid defenses, they aren’t playing great defense in Snyder’s bend don’t break scheme without real talent, particularly up front at DE, and without continuity in the defensive backfield to allow them to play precise, pattern-matching coverages. Kansas State has been burned since 2012 due to a long list of different factors. Their turnover from year to year often leaves them with fresh holes at different areas of the defense. The better defenses have been marked by having a star pass-rusher at DE. The 2012 defense saw Meshak William hit 10.5 sacks on the year and Adam Davis added another seven. The 2014 defense had Ryan Mueller (five sacks), Jordan Willis (4.5), and also Elijah Lee in their third down package (five sacks). The 2016 unit was paced by Jordan Willis with 11.5 sacks. This style of defense depends primarily on A) solid, assignment sound players at every position and B) a legit base pass-rush. I’ve been arguing that they should update the scheme, perhaps to a Iowa State-esque 3-3-5 that allows them to maximize their knack for cranking out strong LBs and can help them avoid needing a super-rangy outside-backer or a star nickel who can handle all of the tasks at that position. The other solution would be to just recruit better, if they had a Randall Evans, a Meshak Williams, and an Elijah Lee on the roster every year their 4-2-5 would still hold up just fine. So 33-year old Blake Seiler, what changes might he make to the defense? Seiler is by far the most active recruiter K-State has. How many of his targets turn into commits, I'm not sure % wise how successful he is. But he's certainly the most involved. Covers a ton of states, high school and junior college markets. Well there you have it. Seiler has a strong rep for coaching and developing his positions but the bigger story here is that Kansas State has a chance to get younger and more energetic on the recruiting trail and that’d be as good or better than updating the scheme to make the most of their defensive rosters. The Wildcats need to be scouring the JUCOs and places like Louisiana, Missouri, or Texas for athletic edge-rushers. Ryan Mueller seems to have been more of an outlier in terms of finding a good pass-rusher from the local high schools, although perhaps we’ll see Kyle Ball make more of an impact this coming season. Snyder seems determined to maintain his program for as long as he can in pursuit of a final B12 title or perhaps a national title and this offseason has featured the Wildcats moving on to the next generation of Snyder-tree coaches. The previous generations were pretty dang good so there’s some reason to believe these new branches might be special as well. Now Oklahoma State and Kansas State have revealed their paths to playing better defense in 2018, Oklahoma you’re up next. Totally agree. I don’t know the stats offhand, but I would include Justin Tuggle as a contributor on that defense. He converted from QB to LB, and added a good deal of athleticism. If I remember correctly, he spent some time in the NFL.